Not Afraid of Love is the name of the sculpture from Italian artist Maurizio Cattelan. He is well-represented with multiple pieces in the Rubell Collection. 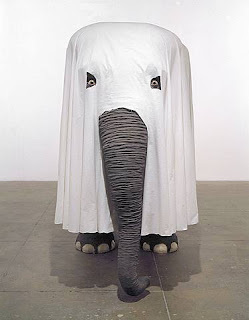 This piece is the size of a young elephant shrouded in white fabric. It is the "elephant in the room", something major that is on everyone's mind and impossible to ignore. But nobody talks about the "elephant" because nobody knows what to do about it. The name suggests that while we all want to fall in love, we are afraid to commit. We get in to relationships while hiding behind a facade, not exposing our true selves. The unbearable lightness of being is impossible to ignore.